Nokia N8 , E6 or X7? Mobile phone reviewers get to tinker with a wide variety of handsets and so can give positive and negative aspects of each from a position of experience. Of course most consumers rarely get the opportunity to use more than one phone every 18 months to two years, so making the right decision is very important. If you love Nokia mobiles and do not know whether to get the Nokia E6, Nokia X7 or Nokia N8, read on for a brief comparison of the three. Both the Nokia X7 and N8 are predominantly touch-oriented mobiles, with sleek bodies and large displays measuring 4 inches and 3.5 inches respectively, doing away with physical buttons in the process. The Nokia E6 is much more traditional, sticking with a bar design and a smaller screen which allows it to have a full QWERTY keypad in place of expansive touchscreen displays. The trade-off is that while typing is more accurate, the E6 lacks the screen real estate to run some of the more complex apps, so sacrifices are made on both sides. The good news when it comes to picking between the Nokia X7, E6 and N8 is that each is equipped with essentially the same components running under the hood. This not only ensures a consistent experience when using the software but means you do not have to worry about picking a phone which might not offer the same levels of performance as its rivals. 680MHz processors and 256MB of RAM give each mobile enough clout to render web pages relatively smoothly, show Flash content and burn through the latest games and apps with the help of the impressive GPU. The Nokia N8 takes the cake when it comes to internal storage, sporting 16GB of built-in memory for you to add your files and media clips to as you see fit. Both the Nokia X7 and E6 have 8GB apiece, although none of these models is limited to its integral storage because microSD memory card slots mean you can add up to 32GB of extra space to each should the need arise. In this arena the Nokia N8 is once again the dominant force, sporting as it does a 12 megapixel sensor to enable high resolution image capture, even in low lighting conditions thanks to its 'extendable' Xenon flash. The X7 and E6 have eight megapixel snappers, which are respected in their own rights, but do not even attempt to match the N8 for fidelity or performance. HD video capture is available on all three, letting you record 720p video clips when you are out and about, which is definitely a feature that needs to be found on high end handsets today. 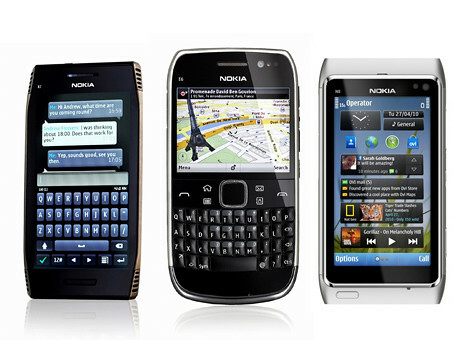 Each of these Nokia mobiles has the Symbian operating system onboard, with the X7 currently sporting the latest release - Anna. This provides customisable homescreens, impressive web browsing and access to the Ovi Store and associated services to help expand the functions available. The Nokia E6 comes with a few businesslike apps included for document editing and mobile security, giving it the edge here, but its small screen means that for media playback the Nokia X7 and N8 are definitely preferable. You will need to use your own tastes and requirements to help you pick between this trio of telecoms devices, but the good news is that none of these should leave you disappointed if you're looking for a solid phone.